Are you curious about some of the products found within the Amazon Rainforest? Keep reading to discover the natural skin care benefits of bacuri butter, black clay and buriti oil. 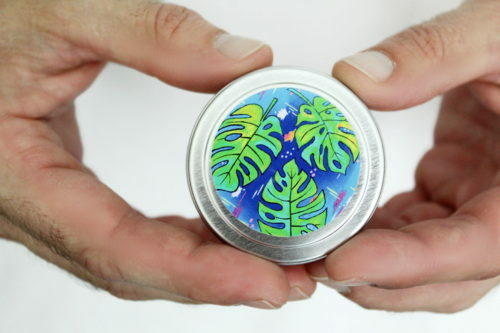 Sourced from the Brazilian Amazon Forest, learn how you can use these natural ingredients to create your own natural Amazon black salve recipe. If you really take the time to consider how much medicine has changed since our grandparents and great grandparents were children, you’ll see a huge shift. We’ve moved from treating illnesses with nutrition and natural remedies to synthetic drugs developed in labs. One only needs to listen to the grocery list of side effects on drug commercials to begin to question, are these treatments really better for us? When I was a kid, black salve would remedy a boil. Iodine would heal a wound. We fought colds with fire cider and whiskey. In short, we worked with what nature gave us. While medical advances such as anesthesia have led to many improvements in patient care, it’s important to develop a healthy balance between the two. Recently, Paris Fragrances has facilitated my discovery of many beneficial skin care ingredients from the Brazilian Amazon Forest. Sustainably harvested for the fruits and other plant materials that grow there, the Brazilian Amazon Forest’s rich biodiversity is home to a number of indigenous remedies and medicinal plants. Home to products such as Brazilian nut oil, bacuri butter, tucuma butter and cocoa butter that are native to the Brazilian Amazon Forest, these ingredients make wonderful additions to natural skin care products and home remedies. Further, as the commercial sale of these ingredients produces more income for those who reside in the region than both non-sustainable timber and cattle pasture combined, their use supports keeping the Amazon Rainforest intact. I love shopping for these specialty ingredients from Paris Fragrances. Not only are the prices and quality of their products amazing, but they carry natural ingredients I can’t find elsewhere. I’ve also really enjoyed learning about so many new ingredients. 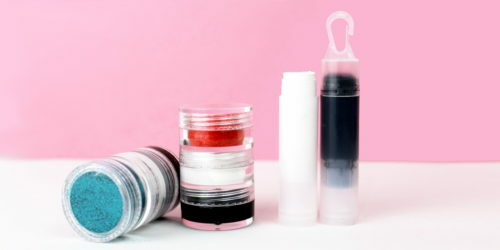 However, coming up with new ways to use these sustainable products in my natural skin care recipes has definitely been the most rewarding part. My Amazon black salve recipe offers an exciting twist off the traditional Amish black drawing salves. 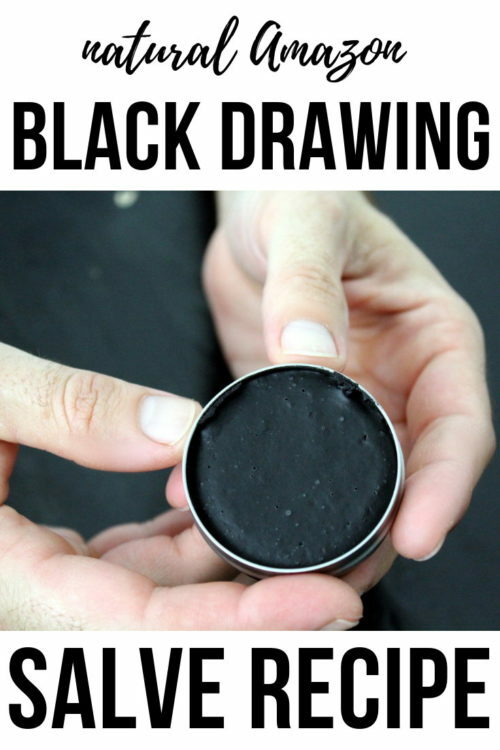 It’s similar to an Amish black drawing salve in that it contains activated charcoal. However, it also contains three ingredients found specifically in Brazil. 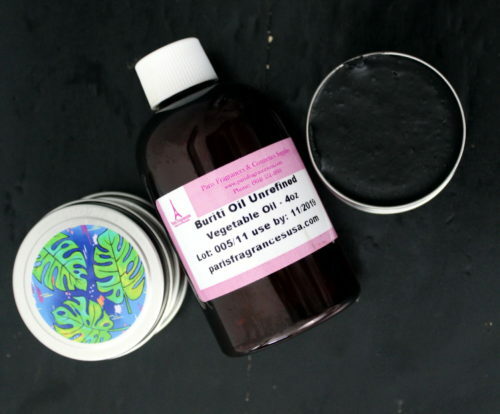 These ingredients are volcanic black clay, buriti oil and bacuri butter. Bacuri butter, which has been historically used by Brazilian natives as a natural remedy for snake and spider bites, plays a key role in drawing out matter from skin. This makes it an effective remedy for insect bites, stings, boils and even acne. While buriti oil, which is bountiful in vitamin A, promotes skin health to hasten the healing process. Brazilian volcanic mud black clay, like bacuri butter, also works at pulling or drawing out moisture from skin. Naturally rich in silica, magnesium, calcium and iron, this clay is especially effective against acne and other problematic skin conditions. The black clay available from Paris Fragrances originates from the slow and millenarian erosion of rocks. This results in a diversity of minerals that are part of its natural composition. The clay is then sustainably extracted in the region of Minas Gerais in the South of Brazil. This is where the largest deposit of kaolin clay can be found, caused as a result of the erosion and sedimentation of rocks in the Serra do Mar. 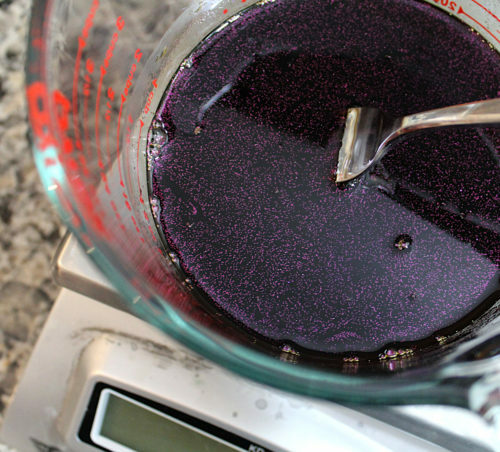 You will need a digital scale to weigh out the ingredients for my Amazon black salve recipe. 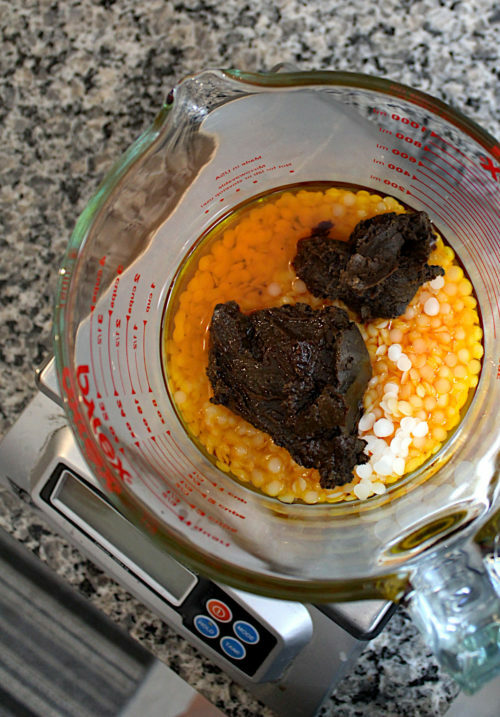 Begin by weighing out the buriti oil, bacuri butter and beeswax into a small glass, heat safe measuring cup. Slowly heat using the double method until all of the beeswax has melted. 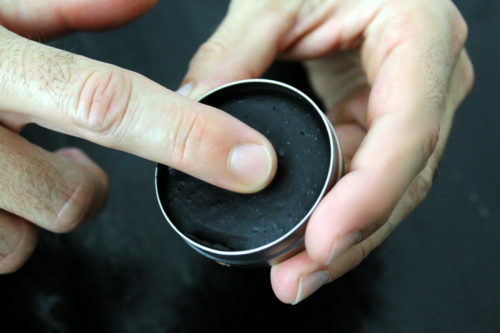 In the meantime, weigh out the activated charcoal and black clay into a separate container. Once the beeswax, butter and oil mixture has completely liquefied, remove from heat. Add twelve drops each of both rosemary and lavender essential oil, then stir to combine. Now add the dry ingredients to the liquid ingredients. 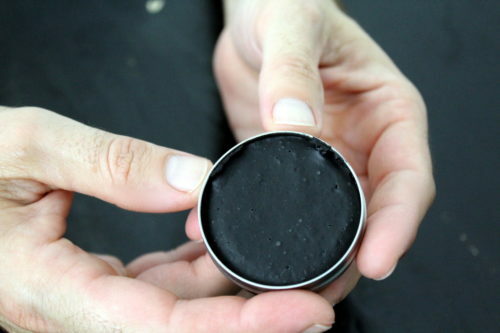 Slowly fold them into the salve, then mix well to evenly combine the charcoal and clay throughout the salve. 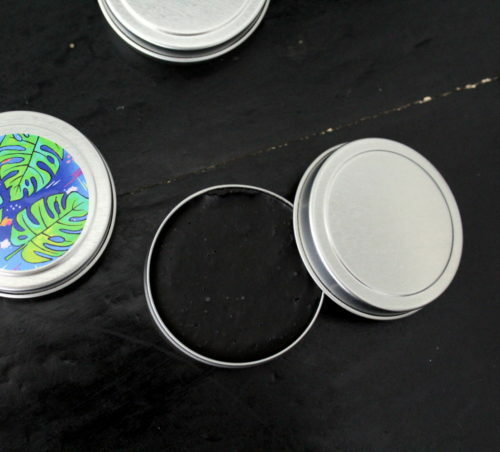 Once your salve solidifies it’s ready for use! 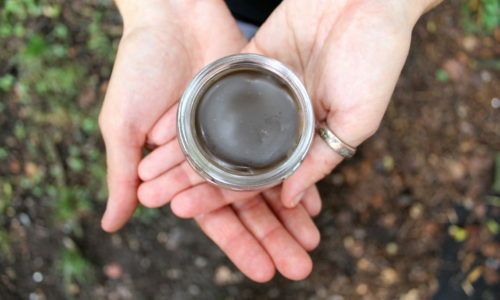 Use your Amazon black salve recipe as a spot treatment for acne, insects bites, bee stings, splinters, minor infections and boils. If you enjoyed my Amazon black salve recipe, then give one of these other Brazilian Amazon Forest inspired skin care recipes a try! 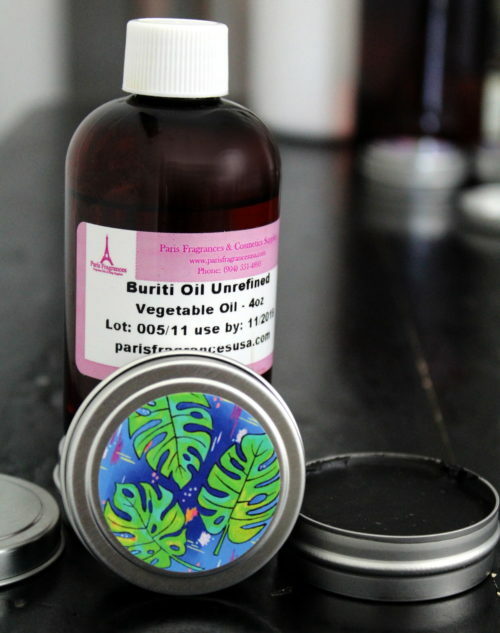 You can purchase all of the Brazilian Amazon Forest body butters and carrier oils you need for these recipes from Paris Fragrances. Have you used any of the natural products from Paris Fragrances? I’ve love to hear what you’ve made! So be sure to share your creations in the comments. For more great natural lifestyle and skin care recipes from Soap Deli News blog, be sure to follow me across all of your favorite social media platforms. You can find me on G+, Pinterest, Facebook, Twitter, Blog Lovin’ and Instagram. Or, alternately, you can also subscribe to Soap Deli News via email for future updates, DIY projects and recipes. As the weather cools off and spirits skirt through the city, it’s time to reevaluate our skin care needs for the new season. This easy Halloween solid lotion bar recipe offers the perfect spook-tacular mix of fun and function for fall. You can even make your DIY lotion bars glitter-tastic for a fabulous handmade gift idea everyone will love! Point being, just because we’re all grown up doesn’t mean we can’t still have fun. Halloween is kind of the perfect time of year for that. I can’t think of a better way to spend a holiday filled with mystery than visiting my favorite haunts with my friends. My friends are some of the best people out there. Not only do they help me through the struggles and chaos life seems intent on throwing our way, we also share some amazing moments together. So what better way to remind your friends (and co-workers) that, they too, are an important piece of your life than with a simple handmade Halloween gift. 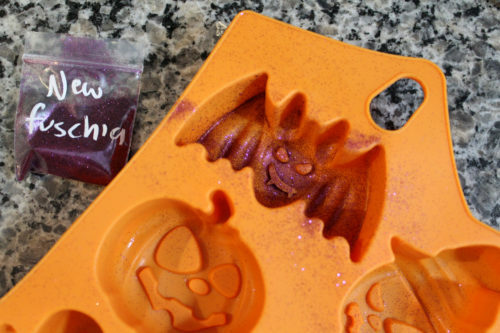 These easy Halloween solid lotion bars are not only cute, they’re also super practical. If you have dry hands in the winter, then you know how important it is to have a quality hand cream on hand 24/7. (Especially if you’re washing your hands 20x a day to fend off those monstrous cold & flu germs.) 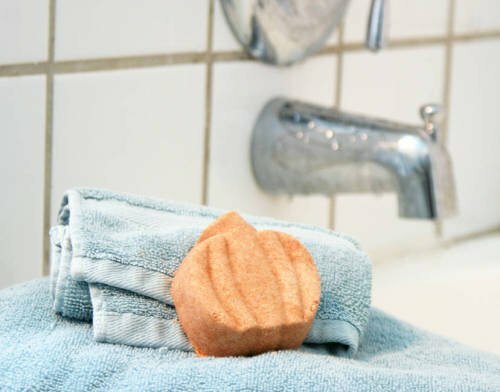 These lotion bars are perfect for moisturizing and protecting your dry skin. They don’t stop there, however. I also scented my Halloween solid lotion bars with a calming blend of cedarwood and lavender essential oils. So you can keep calm and carry on no what your work day throws at you. As with some of my more recent skin care recipes, my Halloween solid lotion bar recipe utilizes bacuri butter as one of three primary ingredients. 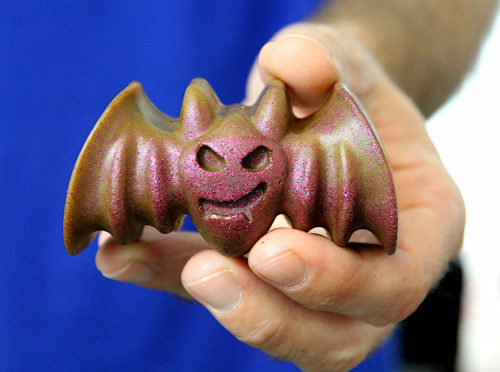 This is what will give your Halloween shaped lotion bars their dark color. Additionally, it also ensures a fast absorption rate. After all, no one wants greasy fingerprints on their keyboard. I’ve also included beeswax to solidify the bar and to protect skin. While buriti oil – a carrier oil rich in fatty acids as well as vitamins C, E and pro-vitamin A – helps to rebuild, moisturize and hydrate skin cells. Additionally, buriti oil also helps to reduce the appearance of fine lines and wrinkles, promotes healing (bye-bye cracked knuckles!) and protects skin from free radicals while also increasing skin’s elasticity. As with the majority of my skin care recipes, you will need a digital scale to weigh out the ingredients. 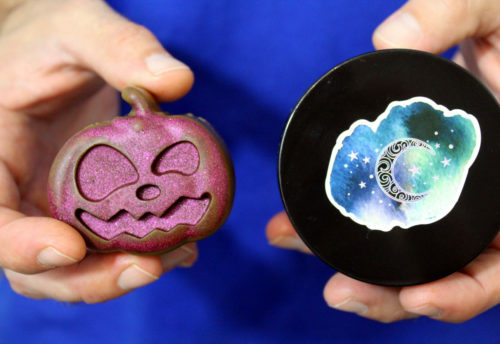 In addition, you will also need a Halloween silicone mold of your choice. (I used this one.) My Halloween solid lotion bar recipe made four lotion bars – one each of a pumpkin, a bat, a skull and a ghost. Begin by weighing out the bacuri butter, beeswax and buriti oil. Combine in a heat proof Pyrex measuring cup or similar. Gently heat until the beeswax and bacuri butter have melted using either the double boiler method or in your microwave at 30% power. Once melted, remove from heat. Then weigh out the essential oils and stir into the lotion bar ingredients you just melted. I then added Halloween stickers to the lids of my containers to decorate them. Although, washi tape would be super cute too! You could use it either on the lid or around the diameter of the jar. I also thought about making an emulsified sugar scrub or foaming bath butter, filling the jar with it, then nestling a solid lotion bar on top. Tell me what you think! If you enjoyed my easy Halloween solid lotion bar recipe, then may also like some of my other Halloween inspired recipes. Alternately, you may also be interested in my other bacuri butter skin care recipes which you can find here. 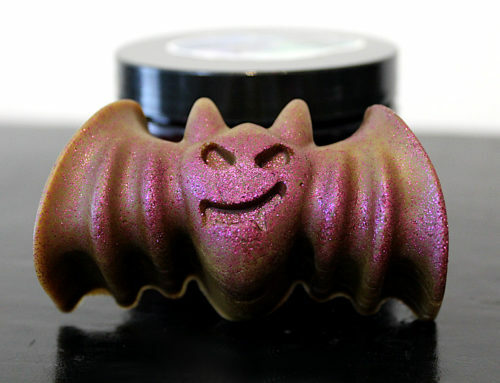 Also be sure to check out some of my favorite handmade Halloween bath & body products on Etsy.